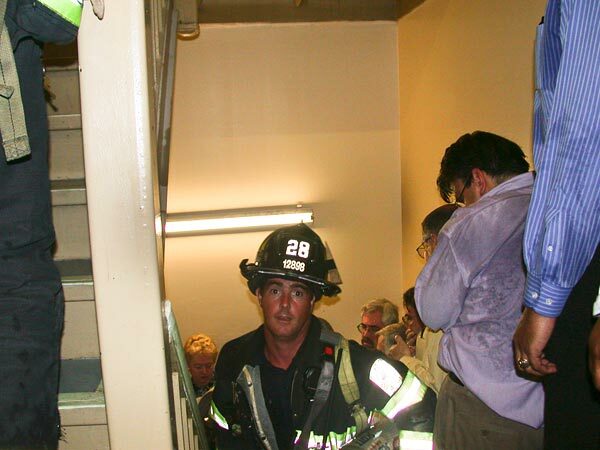 There’s an iconic photo depicting a harried firefighter—helmet #28—in narrow, jam-packed stairwell. In the midst of chaos someone had the presence of mind to capture a tragic piece of our nation’s history. The day was September 11th, 2001. As terrified workers run past, the firefighter was running UP towards the inferno, not DOWN towards safety. The look in his eyes says it all—there’s undeniable fear in them, but there’s sheer determination as well. Everything he’s dedicated his life to up to this point has come to fruition. The call came and he answered it—knowing full well what lay ahead. Many forget that our nation’s birthday—to be celebrated today with cookouts, fireworks, family and fun—wasn’t just another day in the lives of a couple of powdered-wig gents. With each stroke of the pen as the Founding Fathers signed the Declaration of Independence, no doubt a certain level of fear glinted in the eyes of each signer, though their faces—tempered by the determination to preserve life, liberty and the pursuit of happiness—likely didn’t show it. What now remains a document as “commonplace” as baseball and apple pie was once an incredibly controversial piece of paper whose signatories, by signing it, knew that they were affixing a giant target to their backs. They signed it, knowing full well that this document meant to set their people free could just as easily be their own death warrant. The significance of John Hancock’s famous scroll—now synonymous with “signature”— wasn’t who he was, but rather how he signed. Rumors have long circulated that Hancock, who happens to be the first of the Founders to sign the Declaration signed the document so largely so that “King George will be able to read that!” Regardless of what Hancock did or didn’t say after signing, the gesture certainly indicates a bold defiance in the face of what everyone in the room knee would be a horrendously difficult fight. They were, after all, about to take on a superior military belonging to the world’s then-superpower. As if signing one’s name wasn’t dangerous enough, Hancock doubled the size of his signature and placed it smack-dab in the middle of the paper. He and the other fifty-five men, much like the firefighter running UP the stairs and towards danger, signed away their lives, their fortunes, and their sacred honor. In fact, those very words grace the final sentence of the document. Today, on this 237th anniversary, let’s examine what that really meant. Their Sacred Honor . . . Many people forget that the Declaration of Independence, which outlined the many grievances prompting the colonies’ withdrawal from the British Empire, was in itself treasonous. It rejected the authority of the king, and established the idea that men could dissolve government if and when it became oppressive. This of course meant that each signer and supporter had just become criminals in the eyes of the British government which, until the colonists could beat it back, still ruled over them. These pinned their very names to an undeniably dangerous document; they threw their names to the cause. Their Fortunes . . .
How many of us roll our eyes at the idea of taking time out of a busy week to participate in our government? Now imagine agreeing to participate if it meant you could lose your job and a great deal of what you owned. What a monumental bravery! While the Declaration certainly set the signers up to be targeted, they also knew they were potentially signing away the fortunes and the livelihoods of the other colonists who would doubtless lose their farms, their stores, their homes, their possessions, and even their families in the impending war. The weight of that bore down heavily upon them. Their Lives . . . Many of the signers were not the hobbling, cane-wielding senior citizens we so often think of when conjuring up images of our Founders. In fact, several of the signers were fairly young. Twenty-one of the fifty-six were under the age of forty; some of those were under the age of thirty. In other words, they had their whole lives ahead of them, and yet they stood willing to lose not only their fortunes, but their very lives themselves. Treason, of course, carried the death penalty. Tethered to this reality were the bloody horrors of battle soon to touch their lives. From Abraham Clark, whose two sons were captured and imprisoned in the brutal prison ship Jersey where they endured special cruelty because of their father, to Judge Richard Stockton, who was betrayed by a British sympathizer, cruelly beaten, arrested, and imprisoned, after which lost his home and all his possessions—hardly any escaped wholly unscathed. John Adams, signer of the Declaration and later our second president once said, “Always stand on principle….even if you stand alone.” Though each signer put pen to paper along with fellow patriots, the reality that just a few colonies were about to take on the world’s premier superpower meant they really were standing quite alone. Yet they stood, firm and resolute—ready to run towards danger so that they and their children could be free. They could have just as easily chosen to “go along to get along” with the British, or retreat into the deep woods of the unexplored lands west of the colonies; in this way preserving their own individual liberty. Instead, their sacrifice ensured your freedom. Always, always be willing to run towards, not away, from that which threatens our freedoms. ← Immigration Reform Part III: Why Immigration Reform … Why Now? “Ready to run towards danger so that they and their children could be free. Always, be willing to run towards, not away, from that which threatens our freedoms.” I love your words of passion and truth. And your article put personal depth to the price that was wagered for our freedom today. Thank you for inspiring us this July 4th. As I was contemplating what to write for the 4th, I knew that I wanted to talk about the price the Founders all paid, but wasn’t quite sure how to relay it in terms that today’s crowd could really understand. Out of nowhere the image of that firefighter popped into my head– and I thought, THAT’S IT! Because in all reality, that’s precisely what they did. They ran towards the fire, full steam ahead. What an incredible group of patriots. I hope that you and Bev had a lovely Independence Day! !